He�s a luthier who�s worked with Les Paul, Michael Hedges, Kenny Rodgers, Bob Dylan and Tom Petty. He�s toured the United States, and has played for audiences of 10,000. He�s been described as one of the premier acoustic guitarists in North America, yet his common name still goes relatively unnoticed. So who is Mr. Tom Smith? Active in the American music scene for over 30 years, from one end of the fret board to the other, Tom Smith lives and breathes the acoustic guitar. Musically monotonous he is not, if the idea of guitar virtuosity scares you. He is charged with a dynamic energy all his own that isn�t overtly pretentious or a flash in the pan. Rarely does Smith disrespect his musical roots, considering that his work is a hybridized combination of folk, jazz and blues sensibilities. Given Smith�s wide palette of sounds, his songs sound like they�ve strayed a little bit off course. They�re very interesting to listen to, but when tracks like �Child�s Play� start hitting the two minute mark, a shapeless feeling soon takes centre stage � almost as though Smith had to retrace his steps to figure out where to go next. While his instrumental vocabulary is astonishing, the very homemade production sound begins to distort the different voices employed in each song. Smith is great at creating grooves, but his switch between banjos, slide guitars and open tunings makes it wearying to secure some sort of emotional connection with each track. And even though his individual sounds are captivating, at the end of the day, the whole is somewhat dissatisfying. The curse of bad production is, well, just that. Aside from the sound quality complaints, because there are NO overdubs and multi-layered parts (that Smith is more than capable of laying down), his pieces border on being chaotic, notably in tracks like �Some Other Blues (For Some Other Lady).� Maybe the best way to understand this is to put it this way: we all know the people who like to keep on talking, who just steam roll over all chances of somebody else contributing to the conversation. As they keep going, we pretend we�re fascinated by what they have to say, when in fact, the only thing we�re thinking is �Wow. Take a breath.� Although this is a bit of a stretch, this is what can happen when you don�t have overdubs. It suffocates all chances of having the other people in the room join in and share their thoughts. The natural rests and breaks in the musical conversation are not here. In its breathless approach, the listener simply tunes out. The other complaint with Juliet�s Window is that it�s firmly latched to the folk roots, which doesn�t work so well if Smith isn�t in your house to explain the stories behind the songs. Why does the banjo-driven piece, �On Any Given Night,� become frustrating midway through? Is it supposed to represent an indecisive thought process? Or is it an expression of joy, with its upbeat rhythm? Smith is apparently known for his stories when performing live, but the disjointed feel of arranging multiple songs that all need their own individual space to breathe on one disc (without the assistance of a tale or two), makes it a tiring listen. Smith needs to apply his astonishing range of techniques in a more specific manner, which the track �Paper Dragons� best illustrates. The songs sounds as though Smith has run his acoustic guitar through a light distortion pedal and played with the EQ levels (giving it an intriguing overloaded and low-fi personality). If this is any indication of his curiosity to explore what can be done with the acoustic guitar next, it won�t be long before he�ll be snapped up by major labels and hailed by legions of guitarists worldwide. But if Smith�s allegiance to good ol� chicken picking is his preferred cup of tea, I�m not there to stop him. However, I will wonder why he isn�t exploring the directions being paved by artists like Kaki King and Justin King, or Pat Metheny and John Scofield, or Tony Rice and Michael Hedges. He�s got the talent. He�s more than ready. But he needs a push. 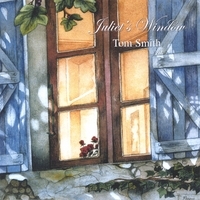 At the end of the day, Juliet�s Window is a series of clever, note-dense acoustic tracks from previous Smith albums. The earthy appeal of the finger-style craft, with a laid back approach, will be embraced by casual listeners and finger-style followers alike. Will Smith become a household name in the guitar community? That may be difficult to answer if he doesn�t set himself apart from his counterparts � creating a voice that has a new story to tell. While it won�t blow you away or shake accusations of being �aural wallpaper,� it still may be worth a look to see what�s in Juliet�s Window.